VacuMed's "TurboFit" software now features a new Report Generator that allows you to print any single page, spreadsheet, graphic display or summary report or you can pre-configure 6 report groups. Each report group may consist of any number of individual pages. Once you have configured your report group, a single click will print the selected group. 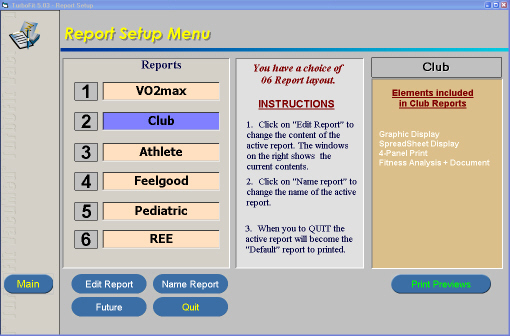 So Dr. Feelgood can customize a report group exactly to his liking and name the group "Feelgood", thereafter just click the "Feelgood" button and his report automatically prints. Click here to download the Athlete Report.PDF sample report group. Click here to download the Training Schedule.PDF sample report group. Recently, there has been an increased interest in the measurement of Resting Energy Expenditure (REE) in relation to weight loss management, partly due to a number of new drugs, some still in development, that increase the metabolic rate. A metabolic measurement system, such as VacuMed's Vista systems are the only reasonably priced method of actually measuring REE. Click here to download the REE.PDF sample report group.